Kateřina Fridrichová’s study on using flipped classroom while teaching research methods attracted my attention because I have taught myself different research methods courses for many years and I have also thought how to make a course that students always perceive difficult and challenging more attractive and enjoyable for them. Fridrichová provides an insightful introduction to flipped learning, which entails shifting the information transmission out of the classroom and using the class time for student active learning. She reflects on why it works, along with offering practical teaching strategies. Studies have shown that as a result of flipped learning, students in flipped classes not only learn the content of their course better than in a traditional course setup but they also learn to take more responsibility for their work, make greater strides toward becoming self-regulating learners, work harder and demonstrate more from their knowledge during class time. What is important, they are generally happier with the course (see, for example, Abeysekera & Dawson, 2015; Awidi & Paynter, 2019). I find the most interesting and useful part author’s careful reflection on how her teaching innovation worked in the classroom and what she recommends changing when using this approach in the future. Her reflection is based on an analysis of six different sources of data she collected before, during and at the end of each course session. Data collection methods and analysis are very solid, as it can be expected from a teacher of a research method course. This makes the study a very good example how a university teacher can evaluate her/his teaching and student learning. Moreover, this serves a good example how scholarship of teaching and learning can support university teacher´s professional development and learning as a teacher. This chapter will be of great interest for any academic interested in using various teaching methods to create a more engaging and meaningful learning environment for their students. 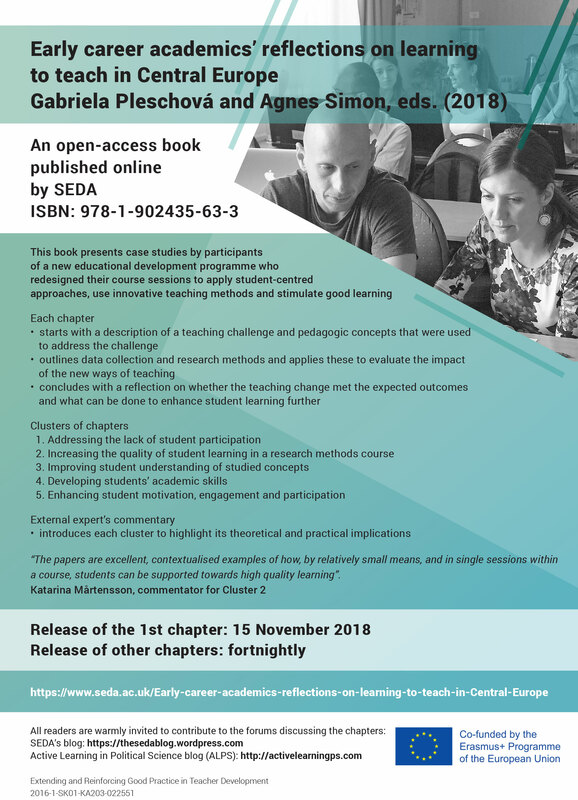 SEDA is publishing an open access book online, with a chapter released on its website every fortnight. Each time a chapter is released it will be accompanied by a blog post published on SEDA WordPress. The book is called Early Career Academics’ Reflections on Learning to Teach in Central Europe, edited by Gabriela Pleschová and Agnes Simon. This book contains case studies by participants of a new educational development programme who redesigned their course sessions to apply student-centred approaches, using innovative teaching methods and stimulate good learning. This entry was posted in Blog, Early Career Academics' Reflections, SEDA and tagged Early Career Academics' Reflections, Educational Development by SEDA. Bookmark the permalink.